Sure thing. Contact our Mother Shucker, Katrina Brees at thebeardedoysters@gmail.com or text/call 504-905-2830 or see if we answered your question below or on our FAQ page. What are the differences between membership levels? Silver sequins flapper headband with a white ostrich feather and a hand sculpted oyster shell with a real pearl as an accent. White faux fur stole with polar fleece on the inside to keep you warm and cozy during cold parades. Various swag that we have that day. You just need to fill in the rest of your costume with white and silver costume pieces. $300 Shucker Membership. This is a lifetime membership. You will be invited to all the parades and parties we have throughout the year and for years to come for the lifetime of our krewe. The Shucker costume includes a white chef’s hat and official Bearded Oysters logo white apron as well as a logo backpack. We ask that you wear white and silver clothes underneath. $200 One-Day Pass. This membership level enables you to join us for a single parade. We understand not everyone is able to create a parading lifestyle, but still want you in our krewe. You will be responsible for wearing white and silver to the parade. During the parade, your options are to be a wings dancer, banner holder or bubble blower. If you later decide to become a Bearded Oyster, this $200 can be applied to your lifetime membership fee. You can join anytime you want. The beauty of being a Bearded Oyster is freedom. 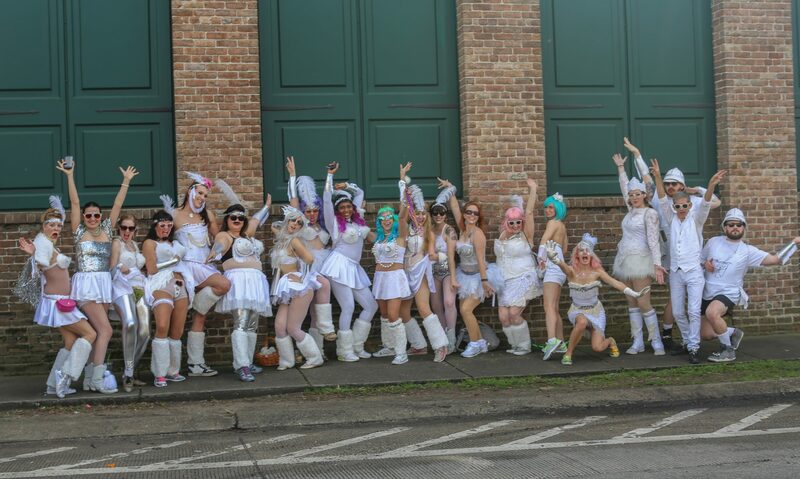 You are welcome to join our krewe any day of the year. Once you have joined you will begin receiving invitations and information to all our upcoming parades, craft parties, and events. All of the events are optional. You can join our krewe above by choosing your membership level and sending your payment via PayPal. If you do not want to use PayPal, contact the Mother Shucker to make other arrangements. The Mother Shucker will begin emailing you with parade, craft party and event invitations once you have joined. You will be able to pick up your costume in person in New Orleans or arrange with the Mother Shucker to have your costume shipped to you. Its up to you. Whether you have lots of time to craft and parade, or just some precious moments, being a Bearded Oyster offers you the freedom to participate when it is right for you. We typically have about 5–7 parades per year, as well as various parties. All are optional. Yes. Many members received their memberships as gifts and have truly enjoyed the unique and special experience of being a Bearded Oyster or Shucker. You are welcome to purchase a Bearded Oysters membership as a gift certificate for a special person in your life. We can work with you to create a card or small gift box to surprise them with. If you have any questions please contact the Mother Shucker at thebeardedoysters@gmail.com or call/text 504-905-2830.